This is Queen's second of three visits to Chicago Stadium, for which the band were over an hour late as they got caught in a blizzard. 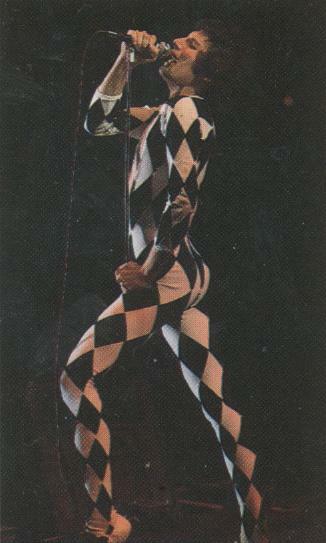 Although Freddie is in great voice, he doesn't sing with as much ease as he would next week in Houston. After the fast We Will Rock You, Freddie says, "We're gonna have a rock 'n' roll party here tonight, and you're all invited!" After Somebody To Love, he asks, "Do you guys remember a kind of a medley the last time we were here?" They remember. "Okay, we have something similar tonight, but I think this time we've kind of sort of increased it in length, and I think it's slightly better... bet-ter... bet--tahhhh," as if he's trying to cover up that American accent he has picked up. In Good Old Fashioned Lover Boy, on "Think of me always," Freddie mistakenly plays an F chord (he's one bar ahead) instead of B flat minor. He quickly corrects himself. After the medley, he gets chatty. "It seems that every time we come to Chicago, we bring the snow with us. It's going to have to change. I don't know who brings it. It's either you or us lot. I think we'll have to come in the summer. Would you like that?" They definitely would, judging by their reaction. Queen then launch into a great version of Spread Your Wings, complete with the accelerated ending like the BBC version. Around this time period, Liar pushes about 10 minutes long. Every version is unique in some way, as the embellishments change from night to night. After tonight's performance, Brian says, "It's fun to play around with those old ones now and again." He continues, "I don't actually like this round thing," referring to his 12-string acoustic. "This is a song which we had some requests for last time and we're gonna do it. We're gonna do it this time. This is from A Night At The Opera, and it's a very pretty song written by Freddie called Love Of My Life." Freddie adds, "It's just the two of us." The audience gives a great reaction after the song, prompting Brian to say, "It's kind of feeling like home these days. It feels very nice. Thank you." Brian is very focused tonight. He has a bit of fun at the beginning of his solo spot, creating some incredible airplane-like effects with his guitar and the delay. He then plays the opening riff of Tie Your Mother Down for twice as long before cueing the rhythm section in. This recording is pretty distant. The rock section of The Millionaire Waltz is cut for a tape flip, with some speed issues before the tape runs out. After another half hour, it cuts out during the first verse of My Melancholy Blues (which indicates that it was a 60-minute tape), and resumes for White Man (where the speed issues recur; the sound also becomes muffled by this point, and doesn't improve). There is another cut after Now I'm Here, which seems to indicate that the taper had two 60 minute tapes on hand, but the encores are missing nonetheless.